Your website is a face of your business. Not only it sells products or services, it represents your company’s values and culture. To attract and retain customers your website has to clearly communicate that customer satisfaction is a priority. How do you show them that you really care and value their time? What can be done to improve user experience on your website? In this article we will take a look at a few great tools designed to make your website visitors feel more comfortable as they browse through the pages, look up information or make their way through to a successful purchase. Amazingly, these tools would also help you save costs, increase sales and make your support more efficient. Sounds like a miracle, doesn’t it? There’s nothing more frustrating for your customers than landing on a website that’s difficult to navigate and use. Actually, the main reason why they come to it is because they believe it will be faster and more convenient than calling or visiting you in person. So the most important thing you can do for your customers is to help them get things done quickly and efficiently. WalkMe is a powerful tool for enhancing online customer experience and satisfaction through enterprise-class guidance and engagement platform. The system allows customer service managers to overlay step-by-step tip balloons – on any website or software – to assist users to successfully complete online tasks. Users are guided by these clear and simple instructions in real-time, so that they are empowered to perform the most complex tasks on their own. When customers have the ability and ease to “do it yourself”, they are far less likely to contact customer support by phone or via e-mail for assistance. This dramatically cuts customer service costs, while at the same time strengthening customer satisfaction as a result of a simple and intuitive user experience. If you can’t run Online Help on your website 24/7 the IntelliResponse Virtual Agent technology might be a good solution to help customers find what they’re looking for when your support team is not available. The Virtual Agent tool acts as an online concierge letting customers receive perfect answers to their queries with minimal effort. It also stands for 24/7 online research agent which is able to recognize the hundreds or thousands of ways a specific question can be asked, and then come up with a single, accurate, consistent and approved answer to the query. Main benefits of using Virtual Agent on your website include higher customer satisfaction rates and reduced number of phone calls and emails to be processed by your support team. This lets your customer support focus on more complex or critical issues that can help save a transaction and keep a loyal customer. In today’s world of sophisticated and experienced online consumers, standing out from the competition is increasingly difficult. Smart and technically savvy customers demand smart customer service, and as part of providing exceptional experience you need to exceed their expectations. If you want your online customer service to be efficient and provide awesome value to your customers, consider adding Live Chat software to your website. With Live Chat solution you give your visitors the option to reach you within a click of a mouse to get any kind of information they might need, in real time. What is more, it lets your offer consumers highly personalized service, recommendations and advice right from your very first interaction with them. Chat operators can at a glance find out customers’ browsing history and keywords they used to get to your website. This information lets you agents better understand what kind of assistance visitors are looking for even before they ask their questions. As a result, they are able to timely help your customers improving their satisfaction. This is the guarantee of success! With its powerful features, no wonder that Live Chat has become the number one support tool helping small businesses from almost any industry build trust and credibility while cutting down support costs. 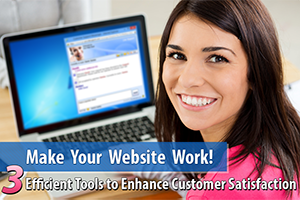 If your website doesn’t have it yet, try Provide Support Live Chat software by starting with a 10-day Free Trial. You will like the results. Would Any of These Tools Match Your Website? That’s about it. Getting back to the miracles, we would like to say that we believe in love and respect working wonders. Put a welcome smile on the face of your business to show your customers you are really interested in them, and they will smile back. Happy customers are key to doing business. Match their expectations with a user-friendly website and excellent customer support. It always pays to invest in positive customer experience. If you use any of these or some other tools on your website we would love to learn about your experience. You are welcome to tell us your story in the comments below. This entry was posted in Articles, Tips and Tricks and tagged customer experience, customer satisfaction, live chat. Bookmark the permalink. The best article until now, great tools, I’m gonna try those..
Yeah you’re right, i think 3 tool you say can enhance customer statisfaction because customer can find problem with that.. thanks for best article.. i love it..
Great Article.. Thanks for sharing..
Only 10 day trial version miss? Yeah you’re right, i think 3 tool you say can enhance customer statisfaction because customer can find problem with that..
Yeah you’re right, i think 3 tool you say can enhance customers statisfaction because customer can find problem with that. Thanks you for any other wonderful post. i think 3 tool you say can enhance customers statisfaction because customer can find problem with that. Live chat is very important for Our business.